"One insurance company has paid out $2.6 million to an individual who has been on claim for over 20 years," shares Jesse Slome, director of long-term care insurance organization. The Association released findings of its study of 2017 claimant data. Part of the study looked at the largest claims that were still being paid as of December 31, 2017. "The last time we gathered information for the largest open claims was 2012," Slome noted. "At that time, the industry's largest open claim totaled $1.8 million." According to the AALTCI report, the female claimant purchased the policy some 13 years and nine months prior to the commencement of receiving benefits. "The initial premium paid was $2,600-per-year, so around $36,000 in total cost has secured her and her family an enormous benefit," Slome adds. "People mistakenly worry that they'll buy long-term care insurance and never receive benefits," Slome admits. "Despite getting over $2 million in benefits for their purchase, I doubt anyone would want to trade places with someone needing care for over 20 years." "This is an important story to tell consumers," Slome a leading advocate for long-term care planning added. "Unfortunately long-term care insurance is often thought of in terms associated with investment vehicles resulting in consumers who worry they may buy something they won't ever need or use," Slome admits. 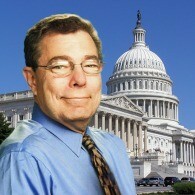 "Long-term care insurance is what I call the 'reverse lottery' with many smaller claims and a few whoppers. But, honestly, unlike the lottery, I wouldn't consider these super large claimants winners -- though their families are certainly glad they have this coverage." The Association posted data on the largest claims paid by five insurers to both male and female policyholders on the Association's website. To see the data go to www.aaltci.org/LTCFacts. 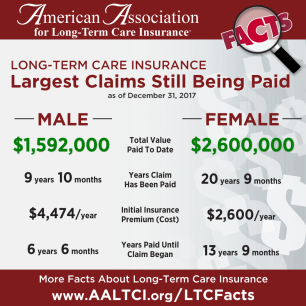 Individuals who want to learn more about long-term care insurance costs and planning options can call the American Association for Long-Term Care Insurance at 818-597-3227 or visit the organization's website at www.aaltci.org to find and connect with local LTC insurance professionals.